My dad and I often talk about how things have changed in the 97 years he’s been around. He was born in 1918 and not many people had cars or telephones, the movies were silent and radio or live theatre was the entertainment. Women didn’t work outside the home and men knew how to do just about anything. I’m sure that was the case in his generation. And I know that most people who build Glen-L boats are definitely smarter than the average bear. But, it’s nice to have some expert instruction about how to wire your boat so it will be safe and meet ABYC (American Boat and Yacht Council) safety standards. Ed Scott’s career began in aviation electronics and then marine electronics for a few years. He then moved into electronics engineering where he was a design engineer and engineering manager for 20 years. Always interested in boats, he decided to enroll in Westlawn to take their yacht design program as well as the Yacht Design School run by MacNaughton Yacht Design. Both programs gave him a good background for small craft design. That experience plus all his years as an electronics engineer have given Ed a thorough background in small craft design and engineering. After his new yacht design education was underway, he went to Eastport, Maine where he worked with yacht designer Tom MacNaughton. He worked with the designer for three years before venturing out on his own. 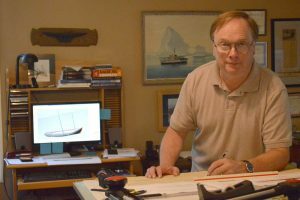 Ed says, “You can learn a lot about yacht design from books alone if you’re smart, but working for an accomplished professional as I did is priceless.” While in his own practice, Ed started teaching part-time for the Eastport Boat School then started working full-time. Ed became the director of the school for its last year of operation under Husson University. Ed taught marine electrical and electronic systems, manual and CAD drafting, small craft design and assisted in boat building classes. Ed also was involved with Professional Boat Builder Magazine’s E-training where he offered marine electrical courses. Ed brings not only vessel design experience, but also project management and marine electrical/electronic/computer system expertise to Bayside Design. Ed holds 4 ABYC certifications as well as NMEA certification in marine electronics installation and ACMA certification in composites (CCT). So, as you can see, Ed knows what he’s doing! Ed says that he thinks the electrical installation is almost as important as the boat itself. And, over the years, he’s seen some pretty scary hobbled together wiring systems. The last thing you want to do is injure yourself or your passengers. You can get your Electrical Design Plans right from our website as a digital download. You choose the plans based on the type of boat, length and system you need. Once you order, the link will be emailed to you in the order confirmation email. The plans range from only $35 to $85 depending on the size of your boat. These can be used on your new Glen-L boat or any existing boat. At such a low price, it doesn’t pay to try and figure it out yourself. It’s well worth getting a set of plans to make sure your boat is safe and meets ABYC standards. Order Plans Here Today!